Creativity is essential to the success and fulfilment of young minds. 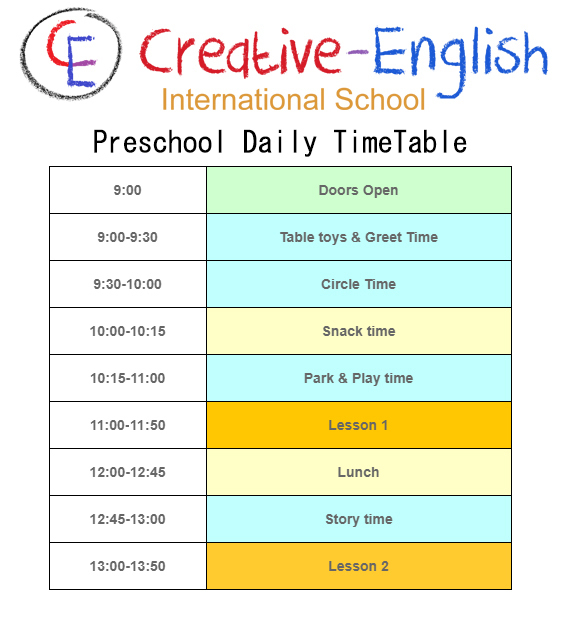 At Creative English we provide a safe, happy and healthy environment for learning. We recognise the unique needs and talents of each child and encourage them to grow. With talented and dynamic teachers we strive for the development of independence and a feeling of self-worth, achieving this by ensuring that all aspects of the child’s developmental needs are worked into our programme and periodically assessed. We aim to ensure that children develop self-reliance and confidence. At the first stages we offer a unique English approach that guides children through play philosophy, which allows children to learn and discover the world around them at their own pace, while exploring their unique interests. As they grow we introduce more specific academic goals to ensure constant progression and discovery of learning potential. Every month we choose a culturally rich study country and an exciting related theme topic designed to set alight their imaginations and help their creative thinking grow. We use a wide range of learning tools such as circle time, music and movement, mixed-age classes, activity stations, one-on-one reading sessions, arts and crafts, science and geography, drama, yoga and outdoor play – all designed to meet the physical, social, emotional and learning needs of your child, while they interact and socialise with their peers. We believe that our Creative English school will provide each child with a strong academic foundation while still offering lots of fun! Currently we offer one daily programme. early drop off and extended care is also available.